I’ve said this before and I’m sure I’ll say it again: Sometimes making a project once just isn’t enough. The reasons vary; some are practical — can you ever have enough wash cloths? — and some are less so, like the joy of working with a favorite material. 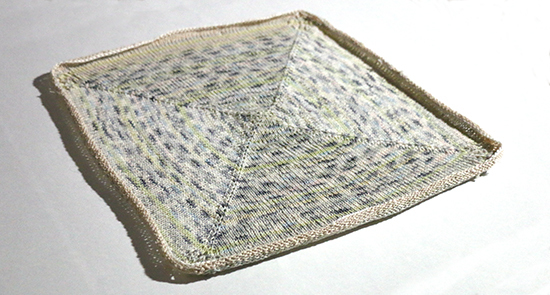 This week I knit another basket liner from the Ripple and Lace Leaf Linen Basket Liners pattern in “The Knitter’s Book of Yarn” by Amy King. As I was finishing up my basket liner last week, I came across two partial skeins of Plymouth Yarn Sockotta. Both were purchased in my early sock-knitting days, before I learned how much dislike hand-knit cotton socks. The first is colorway 6056, which is a self-striping yarn in the palest yellow, pink, gray, and ivory. The second, colorway 13, is a bolder self-striping yarn in off-white, light blue, and light and medium grays. I still had a small quantity of Plymouth Yarn Nettle Grove, and the colors seemed to work well together. With this almost-practical though process — it would use up extra yarn, after all — why not knit another basket liner? The pattern is knit from the center outward. After establishing the initial rounds, I alternated between two of the yarns every two rows. 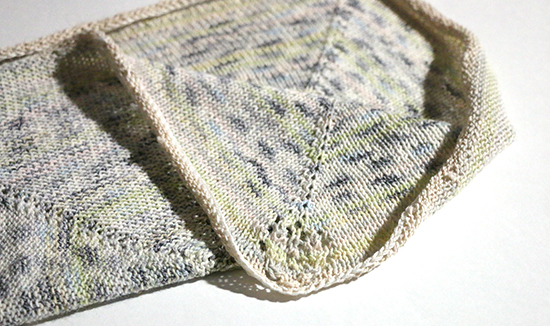 As I finished out the blue-gray Sockotta, I began the Lace Leaf motif using only the pastel Sockotta. 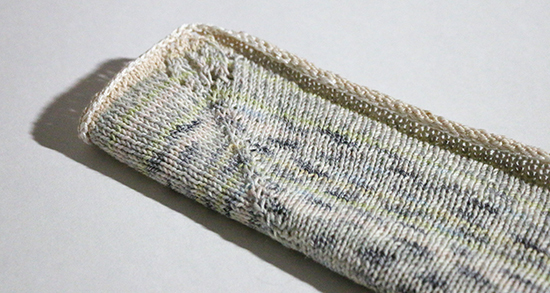 I had knit the design into the last liner, then removed it, and wanted to give it another chance. I’m glad I held off until I was done with the blue-gray yarn because the subtler color changes in the pastel yarn don’t compete with the lace stitches. But waiting brought on a new problem; with a few rounds still to knit, I was almost out of yarn. I dug out my first attempts at handspun cotton, and discovered the yarn was the right weight and color to finish the Lace Leaf motif. I still had to cast off, and once again I was out of yarn. I pulled out some ivory-colored Tahki Stacy Charles Classic Cotton. It’s thicker than the other yarns, but it’s made from five plies. I pulled apart a length of yarn and was able to cast off using three then two plies. This basket liner is a little larger than the last one, measuring about 17 inches (43 cm) square. I didn’t have enough yarn to add purl rows after the Lace Leaf motifs, but I cast off purlwise in hopes of taking a little curl out of the liner’s edges. The laws of physics aren’t so easily fooled. As I look at the liner, I wonder how the blue-gray yarn might have pooled differently if I hadn’t alternated yarns, or if I had alternated a different number of rows. And I still think it might be quite pretty to extend the liner past the Lace Leaf design. So it seems that some times making a pattern twice isn’t enough either. How many times have you revisited the same pattern?